maroon pigment deposited on the edges and the leaves themselves, this loose leaf variety likes to sprawl a bit while it’s growing and thus requires some “dressing up” before it can hit the shelves. To help with that, we’ve created a new branding look for this lettuce – an Alaska grown twist tie with a custom flag that shows variety, growing methods and its origin. Think of it as nifty outfit for its debut at the stores that also helps collect all the leaves in one awesome bunch. 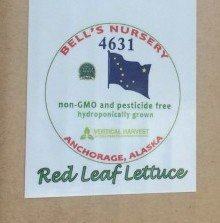 As always, you can find this beautiful variety at Bell’s Nursery and select Carrs/Safeway stores in Anchorage, Alaska. What’s the difficulty level growing produce hydroponically? 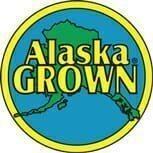 Our goal is to demonstrate to our future clients the simplicity behind growing fresh and nutritious produce hydroponically, here in Alaska and around the world. 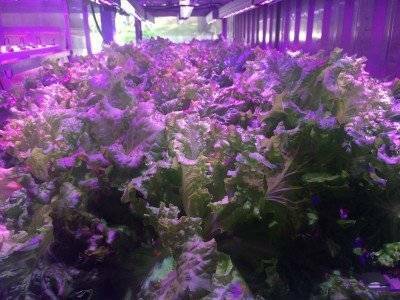 We’ve already researched the type and quantity of nutrients and water you will need, the seed varieties, the proper growing medium, the time from seeding to harvesting, the best LED lights, the right temperature and airflow, all to optimize the growing environment and to take the guess work out of hydroponic farming. The key thing is consistency. Consistency is the secret behind being able to harvest mouthwatering greens week in and out, which is the principle behind growing produce in the CGS. So what are the steps to perfectly grown produce, each and every time? Step 1. Take seedlings from the starting area and transfer to finishing trays. Each seedling comes in a Rockwool cube – not dirt, no mess and easy to handle. Step 3. Harvest in due time. We can customize a schedule that fits your needs. We harvest every week. Step 5. (OPTIONAL) Depending on your “personality”, you can talk to your plants or perhaps play some music. What kind of music? Play something you enjoy, which will make your harvesting time that much more exciting. The CGS does the rest! So how difficult was it to grow this Red Leaf? As “difficult” as it was growing Butterhead, which just loves being in the water! 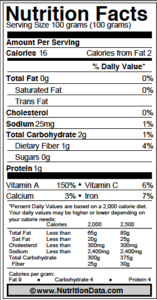 Over 100% of your DV of Vitamin A ( 7493 IU, 150%) and Vitamin K (140 mcg, 175%) ! As it turns out, red leaf is also a good source of iron (1.2mg, 7%), folate (36 mcg, 9%), manganese (o.2 mg, 10%) and not to mention a concentrated source of phytonutrients. This is a very low calorie food with a low glycemic load and high fullness factor. 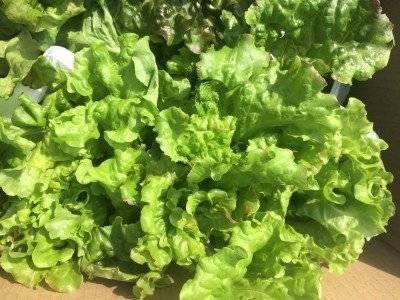 If you pair this lettuce with another food that’s complementary to red leaf’s nutritional profile, you will reap great benefits from your meal. For example, to round out another fat soluble vitamin and add a great protein source, pair Red Leaf with wild caught Sockeye Alaskan salmon, which has good levels of vitamin D (not to mention a host of other benefits). Need more iron? Try a Red Leaf and spinach salad with some chickpeas or beans. (loads of iron there). For heme iron, go with high quality beef liver. For vitamin C, you can’t go wrong with Kiwis or Kale. Just one cup gives you 164 mg or 273% DV and 80.4 mg or 134% respectively. So there we have it. 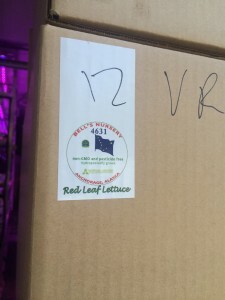 Grow Red Leaf, eat Red Leaf, pair appropriately and be happy! Yeah, I guess the rule is that either it has to grow very fast like leaf lettuce, or grow tall like tomatoes and cukes, or be very high value like fresh cut flowers or those fancy orchids in a small pot that I buy everytime my GF is mad at me. That’s correct. Also, there is location. In a place like Alaska, produce is very expensive, since we pay extravagantly for shipping it from California or Arizona (in case of lettuce). So it makes all the sense to grow leafy greens for example with fast cycle times and higher market prices.